If you love cinnamon bread, you'll be glad to know that it's possible to make or buy a low-carb version. But be prepared to adjust your expectations. Low-carb cinnamon bread is yummy, but most products have a flavor different from classic cinnamon-swirl bread due to the ingredients used to replace flour. 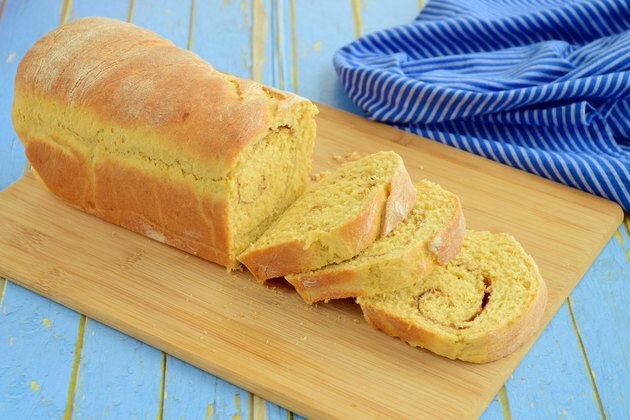 Whether you make your own bread or rely on commercially prepared products, low-carb cinnamon bread delivers about 3 to 5 grams of net carbs per slice. Low-carb cinnamon bread is usually made by replacing wheat flour with a combination of coconut flour and almond flour. If you don't like coconut or almond, you can try other substitutes, like sunflower seeds or walnuts. They're all easy to make into flour. Put them in a blender and pulse until they reach a flour-like consistency. One-half cup of coconut flour has 16 grams of net carbs -- total carbs minus fiber -- while the same portion of almond flour has only 6 grams. By comparison, whole-wheat flour has 36 grams of net carbs, and all-purpose flour contains 46 grams per half cup. A loaf of cinnamon bread may mix about 1/3 cup of coconut flour with 2/3 cup of almond flour. Even if you slice the loaf into six large pieces -- and add the tiny amount of net carbs from other ingredients -- each slice has only about 4 grams of net carbs. Check the list of ingredients when you buy any product, whether it's a prepared loaf of low-carb cinnamon bread or a mix to make at home. You'll notice a variety of flour substitutes, but more important, some contain ingredients you should avoid, like white flour or sugar instead of sweetener. Nutrition information from several commercially prepared products shows you'll get 3 grams to 5 grams of net carbs per serving. A low-carb cinnamon muffin mix can also be used to make a loaf of bread. Another option is to buy a Paleo low-carb bread mix, then turn it into cinnamon bread by swirling in a mixture of cinnamon and sweetener. Some Paleo brands have only 3 grams of net carbs per serving. The cinnamon and sweetener add barely 1 gram of net carbs per slice. Some carb-containing foods like fruits are allowed on a low-carb diet with one caveat: you must limit portions to keep carb intake down. It stands to reason that you might be able to buy any loaf of cinnamon bread off the shelf and make it a low-carb choice by eating only one slice. Don't count on it. Even if the bread is whole grain and says it's high in fiber, chances are one slice is still high in net carbs. Some brands of whole-grain cinnamon bread have 17 grams of net carbs in one slice. As a general guideline, expect prepared cinnamon bread to have 12 to 18 grams of total carbs and 1 to 2 grams of fiber in one slice. That means the smallest amount you'll get is 10 grams of net carbs per slice. If you're currently following a low-carb plan, you already know that even a low-carb cinnamon bread isn't allowed until later phases of the diet, when you add whole-grain carbs to the menu. Once you reach that point, low-carb cinnamon bread is a better choice than many other types of whole-grain breads. One slice of other types of bread, such as whole-wheat and rye, is in the range of 9 grams to 16 grams of net carbs. Baking with flour substitutes involves trial and error. Each type of flour has a quality different from all-purpose and whole-wheat flour, which affects moisture, density and flavor. You'll usually get a better result by combining two or three different flours. Coconut flour absorbs more liquid than white flour, resulting in a denser bread and requiring more water or milk than you'd expect. You'll also need to use extra eggs to help bind the batter, but they're allowed on a low-carb plan. Which Spice Can You Substitute If You're Allergic to Cinnamon?